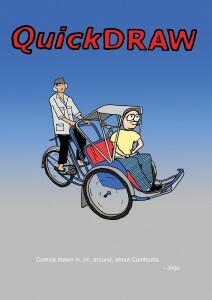 QuickDraw #6 is now available for download via Amazon, iBookstore and just about every e-bookstore on the planet. Set in Cambodia, it’s a collection of vignettes and observations exploring Khmer culture. It’s FREE (excepting Amazon, where a minimum fee of 0.99 is required.) Feel free to download direct via the links below! 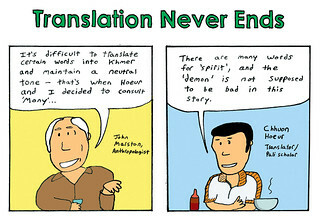 Bonus: here’s a peek at one of our translation sessions, and the video reference it was drawn from. This just in: iBookStore does not accept books in Khmer language. Dang. I could *list* it as English but I’d prefer to lobby Apple to add Khmer language functionality.